Pretty Pink Posh October New Release Blog Hop! Welcome to Pretty Pink Posh October new release blog hop! You should have arrived here from the talented and gorgeous Julia Altermann‘s blog. If not, don’t worry I will provide a list of designers participating in the blog hop towards the end of this post. I LOVE the decorative tag die. It caught my eye the first time Paulina shared the picture with us designers. They will make beautiful accents on a card apart from using as a tag. I imagined the decorative tag in gold used on a card with floral motifs. I couldn’t wait to receive the dies. The Clear Droplets are awesome. They have dimension, flat bottom so they can be easily adhered and subtle accents to any card. Love them. I have couple of cards using the Decorative Tag 1 die and the Clear droplets. Make your self a cup of tea or coffee and enjoy the hop. For this card, I have used images from two stamp sets called Mondo Poinsettia and Mistletoe & Holly stamp sets from Essentials By Ellen. I stamped the mistletoe image on the card front using Soft Leaf ink by Hero Arts and coloured the inside of the leaves with beige Zig Clean Brush Pen. I then added a vellum layer. I stamped and watercolour the poinsettia and leaves, die cut them out and cluster glued them. Since the colours on the background and the focal flower cluster are soft and pastel, I wanted the decorative tag to have a bold contrast. So die cut the decorative tag using black glitter paper. I adhered them on vellum flush, then the poinsettia cluster using foam adhesive to give dimension. The sentiment is from Hero Arts stamp set called Family and Friends Christmas. I LOVE the contrast the black tag against the pastel colours on the card. The addition of clear droplets look like dew drops on the card. LOVE LOVE LOVE it. Clear droplets are a must have embellishment in my opinion. In this card, I have used the decorative tag in gold. On this card, I have used the images from the same stamp sets as the previous card except that I used bright and pretty colours combination of pink and green. Since the colours were bright, I decided to diecut the decorative tag in gold. Here is raised the outer decortive tag using foam adhesives and the inner piece is glued flush. You can see the gold on the decorative tag better in the photo below. I also layered the poinsettias before adding leaves. The poinsettias and leaves are watercoloured using Zig Clean Brush pens. The golden decorative tag makes gives a rich feel to the card. And the clear droplets are my dew drops on the card bringing all the elements on the card together. I always get carried away when I start to create with new goodies. So lucky you I have one more card share. This one is using the Mini Tag Dies. I love the look of the curved mini tag die in the set. So I simply die cut a few of them using watercolour paper. I love the texture of the watercolour paper. On of the tags, I stamped and watercoloured the grumpy snowman from Holiday Grumplings stamp set from Taylored Expressions. On another tag, I stamped the sentiment. I then randomly arranged the tags on a white panel and adhered a few flush on the panel and the rest using foam adhesives for dimension. I trimmed the panel and adhered on red card base leaving a little border of red on top and bottom. To bring in the colours together, I have added metallic sequins from Classic Christmas mix and Clear Droplets. I also added gold twine with a bow on the spine of the card base. I love the stitched detail on the mini tags. These are so cute and can be used as banners as well on a card. Hope you like all my cards. You next stop is to the talented Nicole Picadura‘s blog. Make sure you leave some love to all the designers in the blog hop. There are two $25 gift certificates up for grabs. Winners will be picked randomly along the blog hop. Comments must be left by 11:59 PM PDT 10/18/15. Winners will be announced on the Pretty Pink Posh Blog. Thanks for stopping by today! Happy Hopping and shopping! Beautiful designs! I really love the addition of the clear droplets! I didn't like all your cards – I LOVED them! The gold decorative die is gorgeous and the dashing through the No made me chuckle. Great job! Fantastic cards!! The grumpy snowman is wonderful – what a great card design!! Love all your cards – just beautiful! We always have a white and a red Poinsettia, sometimes pink (when we can find one). And I just love those grumplings!!! Aren't they the cutest?! Oh my my! Love all the bold, beautiful and stunning creations! 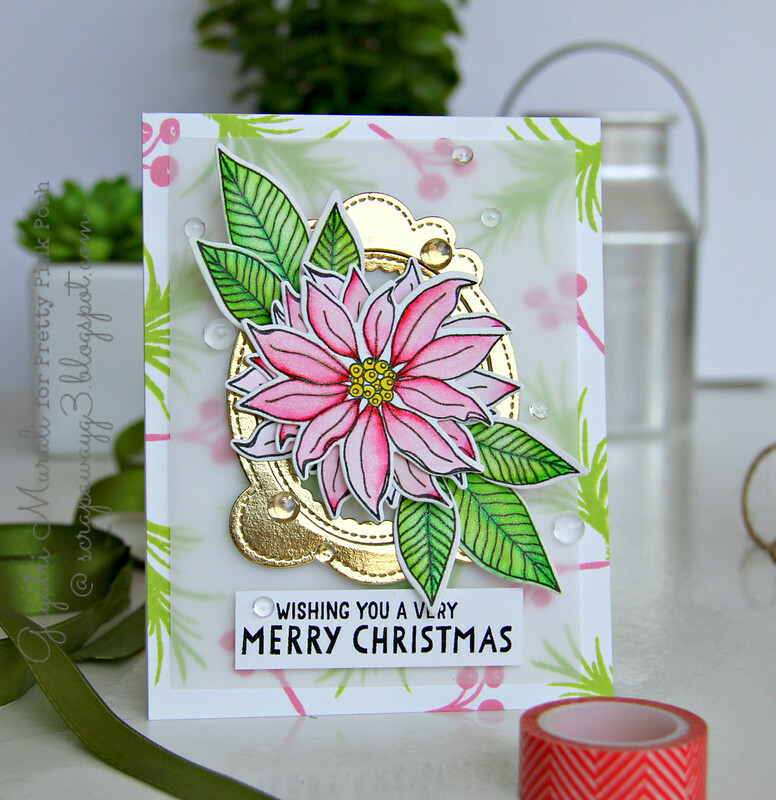 I love your designing and that golden tag is highlighted so beautifully with pretty poinsettia! Love that adorable tags too with cute Santa! Amazing cards, Gayatri!! Love them all! Love the Decorative tag even more in lush gold!!!! LOVE your cards…especially how you used the Decorative Tag behind those beautifully colored florals! Creative uses for these new PPP dies. hahaha!!! LUV that last card the most!!! So very cute! I love how versatile these dies are! OH MY GOSH I so am going to copy you. Love the tag card. However the others are really turning me on to non-traditional colors. I am enjoying all the blogs and getting a lot of inspiration. I especially love the water colored poinsettias. Very good job. OMG Gayatri the color on those poinsettias is stunning.. and that cute snowman made me smile! Framing them with the different colors makes each so unique. the little tags on the front of the card is a great idea. An inspiring way to use the minitags! Wow!! Beautiful cards!! Nice one with the mini tags. The other Christmas card i also very beautiful!! love the black frame , it's so striking and bold! lovely cards. I really love your snowman card!! Love your choices for your cards. Your work is just beautiful! And your snowman card makes me giggle! The sad/mad snowman is wonderful! The gold on the die in the poinsettia was an incredible touch! Those are such lovely backgrounds! Love that black frame and the pale pink poinsettia. Gorgeous card. Haha!! I love that cranky snowman!!! Love your cards and this PPP new release!! The snowman card was adorable! Great job on your cards! Loving those bold florals, golds and vellums together! Great work! That little grumpy snowman is so cute! The look on his face is awesome, and your coloring technique is amazing! Super cute! all your cards are so awesome, your third card was my favorite! I love the flowers in the frames! So beautiful, Gayatri!!! Love the pink and green color combo. 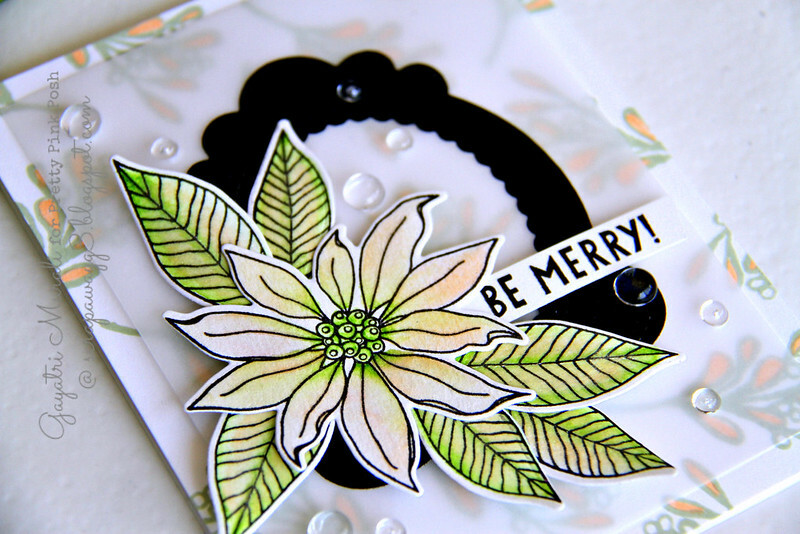 Beautiful poinsettia coloring and design with the Decorative tag die, and super cute mini tag dies for your super cute critter. Your poinsettia cards are gorgeous! Love how you used the tag die! Your three cards are simply amazing! I especially love the gold frame! Beautiful work! Beautiful cards!! And the last one is sooooo FUN!! Wonderful cards! Love the gold and black frame you created using the new Decorative Tag die! your last card is hilarious! Love the angry snowman and that sentiment is great! Gorgeous cards!! I love those mini tags so much, very versatile. Love your coloring too!! Beautiful cards and wonderful use of the dies. What amazingly beautiful cards! Love all of the vellum and metallic finishes you added to them all! Awesome job! Love the background and the coloring used for the flower. Fantastic cards Gayatri!! The poinsettias are gorgeous!! All your cards are so lovely. Love the non traditional colours in the first poinsettia card. 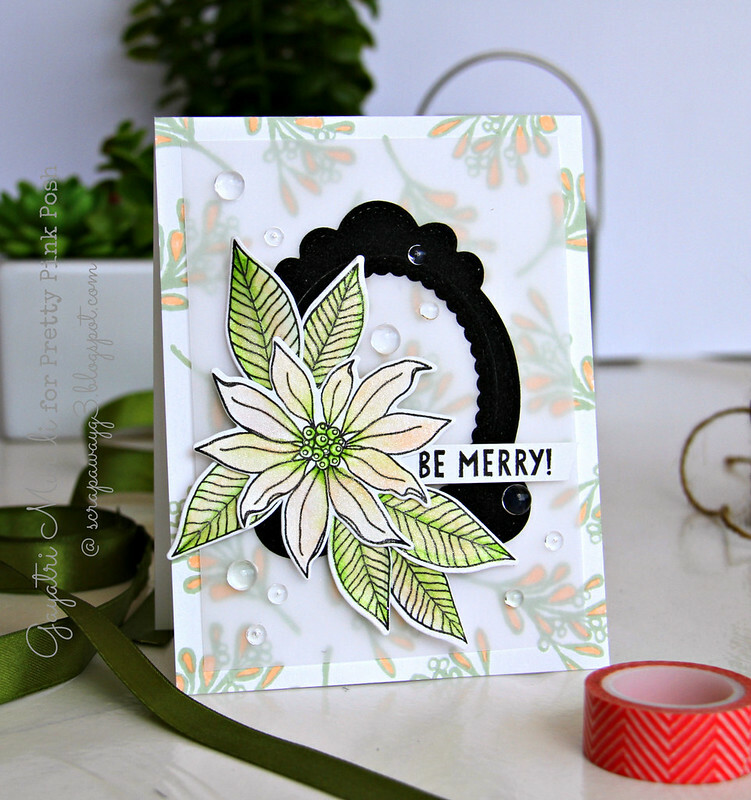 Your Poinsettia cards are beautiful- but I really like what you did with the mini tag patterned card! Great job! Hi Gayatri ~ I always love seeing your cards….you could've made several more and I would have been thrilled to see those too!! Your poinsettia cards are stunning but that snowman? He is hysterical!! That face!!!! Love the multi-use of that die, topped off with the sequins, droplets and gold thread. Love them all. The floral cards are so awesome! Love the gorgeous designs and colors! And the snowman is so adorable! gorgeous cards. Just love the white poinsettia one. Such beautiful Christmas cards and love how you colored those poinsettia's plus how you created such an adorable card using those cute mini tags! Really, really gorgeous all of your cards, loved them. TFS. Beautiful cards – i love the gold decorative tag – it looks amazing!! And clever way of using the mini tags – that's a super cute card!! Awesome cards made!!! Love it!! GORGEOUS, DELIGHTFUL and SUPER CUTE cards Gayatri!!! Your poinsettias are ABSOLUTELY STUNNING – LOVE the design of BOTH cards, the decorative tag makes such a BEAUTIFUL accent behind the flowers and the vellum adds a touch of MAGIC against the background – WOW – GORGEOUS design!!! THANK YOU SO MUCH for sharing – I'm INSPIRED!!! all your cards are so amazing!! love the two with the poinsettias!! Wonderful cards. Thanks for inspiring me! Beautiful cards and colors! Fun! These are such great, versitile dies! Gorgeous cards! All of them are wonderful! Love those new dies and how you used them to enhance your focal point. Beautiful cards! Striking cards! Love the Dashing through the NO! card, it made me laugh. These are such fun cards! Colorful and eye-catching, and they perfectly showcase the new PPP products! 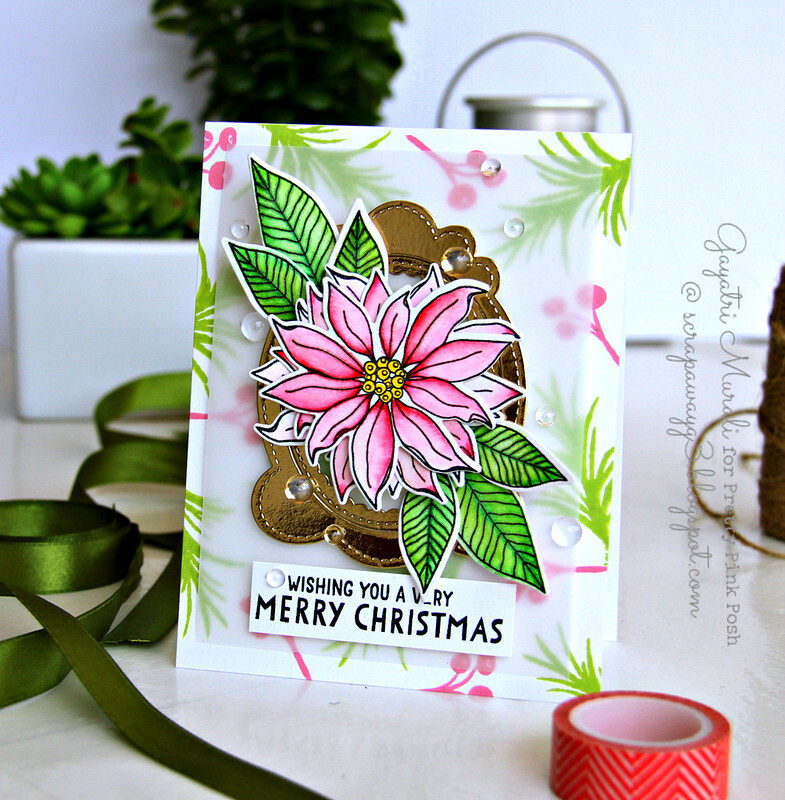 Lovely cards–I love the non-traditional colors on the poinsettia cards! Haha! I like that grumpy little snowman! He amuses me. And your cards are great! That tag card is so original 😊 Love it! I love your cards. The first 2 were pretty, I think I like the 2nd one better, brighter colors. But your third card I laughed out loud. I have that stamp set and I love it because they have my attitude! luv your card designs and coloring! Love your cards…You are an inspiration!!! Wow! The decorative tag is so beautiful in gold! As you know I am a fan of your cards…. The first two cards has beautiful coloring and gorgeous backgrounds…. The last card has a notorious feeling 🙂 I loved the way how you have added the PPP sequins at perfect places….. Great creativity… Keep going on…. Thanks for sharing…. Loving all these cards! 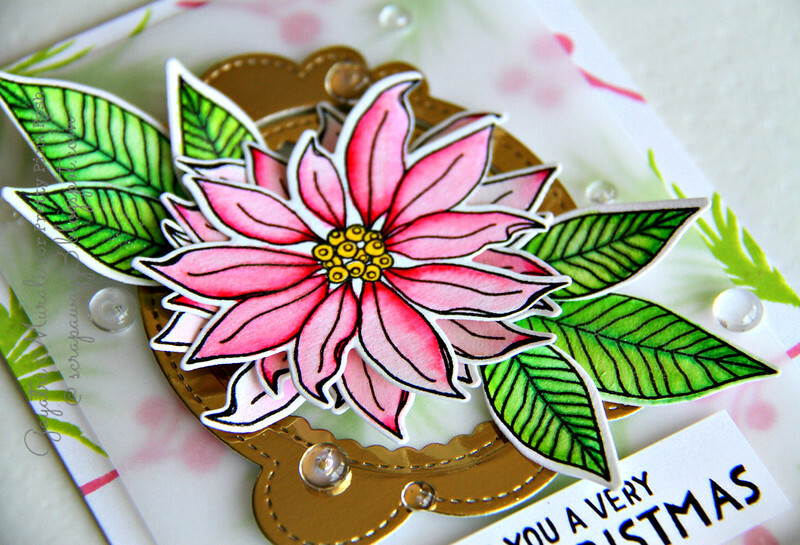 So many awesome ways to use the dies and I love the images you chose for the stamping! Thanks so much for sharing and inspiring!!! HAHAHA…dashing through the NO is SO cute!!! Wonderful cards! The last one is hilarious! Loved the pink poinsettia and the Dashing through the No! Card. Each card is wonderful in its own way…love the sparkle on the poinsettia and the use of vellum on the first, the background on the 2nd and the tag placement on the last. Oh wow love yout cards! The second watercolored poinsettia is just amazing!! Beautiful floral cards and I like how you used the tags on the last card. Wow, great projects. Each one is unique and beautiful. great cards, and i love the poinsettias! Beautiful cards Gayatri. Love the how you used the frame with the pretty poinsettias. How cute!!! I LOVE the poinsettias and that grumblings card is too cute!! So many beautiful inspiring projects! Love them all! Love all your cards, but I love how you placed the mini tag all over your third card! Very creative and fun! Gorgeous cards, love the extra layer of vellum- so elegant!